Da Vinci Enterprises N.V. is a young and dynamic company with business activities in import, retail trade and wholesale. Founded in 1999 with a single retail concept store, the company has since grown to operate fourteen different retail concepts in over 35 stores. Beginning from 2011, Da Vinci has even expanded to other parts of the Caribbean by offering high quality and cost efficient products in multiple branches such as fashion, sportswear and electronics. Due to its expansion, Da Vinci quickly noticed that it would require a system that could not only assist the company in better managing its ever-growing staff numbers but is also versatile in collecting the attendance data. Referring to the demands put forth by Da Vinci, our Suriname reseller, IT-Wizards confidently suggests FingerTec sophisticated solution TA500 to aid in the company’s endeavor. 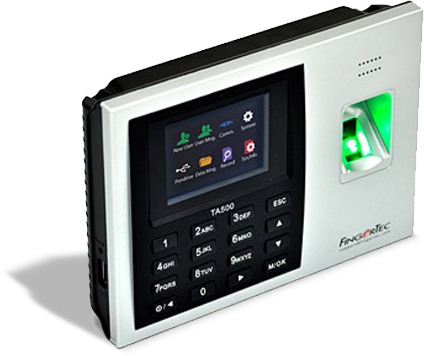 FingerTec TA500 is an affordable, reliable and advanced biometric terminal that efficiently clocks the attendance data of the employees. With a capacity of 2,000 fingerprint templates and 80,000 transaction logs within its flash memory, TA500 is certainly sufficient for a company such as Da Vinci which includes a workforce of over 300 staffs. What’s more, the device is truly versatile; having 3 clocking verifications namely fingerprint, card and password as well as comes equipped with the most commonly used IP communication method for better data management. This in turn will help mitigate any speed bumps during the collection of attendance data and likewise boost productivity for Da Vinci as a whole. Da Vinci has thus deployed 30 units of TA500 along with its bundled software at various operational stores and is able to easily manage the overall employee attendances due to TA500’s flexibility and capability. That said, this represents only one of the array of products offered by FingerTec and to know more about other amazing solutions provided by FingerTec, be sure to click the link below.